On 10 March 1959, thousands of Tibetans took to the streets of Lhasa, the capital of Tibet, protesting against China’s invasion and occupation of their homeland. The peaceful demonstration resulted in thousands dead, and His Holiness the Dalai Lama, together with hundreds of thousands of Tibetans was forced to flee to exile. Now, 56 years later, Tibetans continue to express their will to resist oppressive control by Beijing and to protest the haunting repression they have endured over the past six decades. 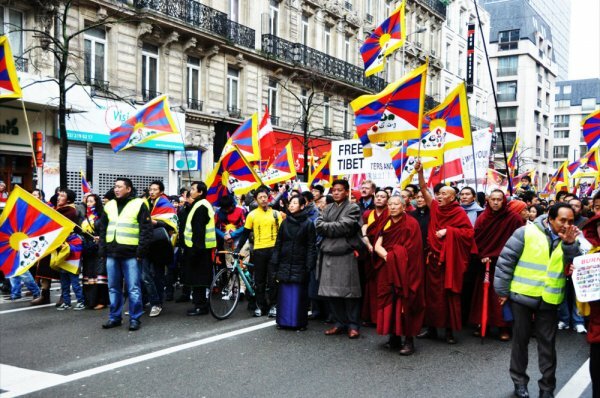 This year, on Saturday 14 March 2015, the commemoration of the 56th anniversary of the Tibetan National Uprising will take place in Paris in the form of a march called “Europe Stands with Tibet”. The march will start at 10.30 am at the Trocadero, and will end with a manifestation at the Mur De La Paix in Champs De Mars. China’s highly repressive policies have caused an unparalleled wave of self-immolations by Tibetan monks, nuns and respected members of the community, as well as students and mothers with their children. Tibetans and Tibet supporters worldwide, commemorate the anniversary of the 1959 uprising every year by remembering the victims and calling for freedom and respect for their human rights in their homeland. The event is a result of a collective effort, organized by two European members of the Tibetan Parliament in Exile, and supported by the Tibetan support groups in Europe, such as the Tibetan Community in France, the International Campaign for Tibet in Europe and the Swiss-based Tibetan Women‘s Association. Thousands of Tibetans and supporters from 15 different European countries are expected to participate in this march. The event also aims to honour the up-coming 80th birthday of His Holiness the Dalai Lama. "We decided to come together to Paris, the city where the words liberty, fraternity and equality have real meaning and a very strong resonance at a critical time for Tibet," said Mr Gyatso, the President of the Tibetan Community in France. The march aims to bring together Europeans and Tibetans to show their solidarity and call on European leaders to look for a solution for the future of Tibet. The leader of Tibet’s Exiled Government, Mr Lobsang Sangay, also agreed to attend the rally and plans to meet with European politicians during his visit. According to the Tibetan Review, he will address the crowds and call on the international community to help restart the dialogue between Tibetans and the Chinese at a governmental level. The former French Minister of Justice Mr Robert Badinter, Vice President of the German Bundestag, Ms Claudia Roth, and former Czech Minister of Foreign Affairs, Mr Karel Schwarzenberg, are the first signatories of the so-called Paris Declaration “On the Freedom Struggle of the Tibetan People”, which was made public on 6 March 2015, and will be presented to the public during the rally. This declaration expresses deep concerns about Europe’s lack of success in influencing China’s policy on Tibet. It calls on European Governments to develop a coordinated approach in addressing China’s policies in Tibet; to formally receive the Dalai Lama and Tibetan leaders at the highest level; and to publicly endorse the Dalai Lama’s proposal for autonomy for the Tibetan people. Following the commemoration event, the declaration will be handed over to Tibetan campaigners, European public figures and representatives of European political parties, who will be asked to join this initiative and to support the declaration. The outcome of the campaign will be made public on the occasion of the birthday of His Holiness the Dalai Lama in July 2015.